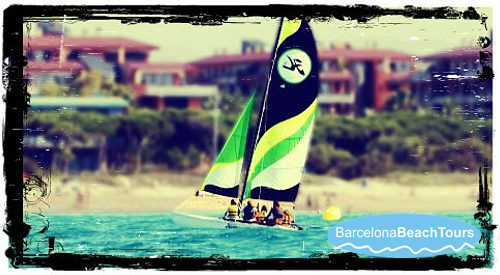 Barcelona Beach Tours offers sailing trips on a Hobie Cat catamarans. The Hobie Cats that we use are the Hobie 15, the TopCat and the Bravo. Sailing small catamarans like the Topcat and Hobie 15 is a lot of fun. Both can be sailed by 1 to 4 people. In a medium strength wind two or three people can really experience the speed of a twin hull sailing boat and sometimes the added thrill of one hull lifting out of the water as the catamaran speeds over the waves. On a Barcelona Beach Tour that includes a catamaran sailing trip the boat will always be sailed by an instructor who can take up to three crew members at a time on the boat. Even on a relatively quiet day there you can experience quite big waves on the coast of Barcelona and if the wind picks up during the sailing trip, so you might have a thrilling and wet experience with plenty of sea spray and movement. The sea temperature near Barcelona is from 22 to 26 degrees in the summer, so you will not need a wetsuit but we do have free short and long wetsuits available for free loan if you prefer..